Ken Stanley is a founding member of Uber AI Labs, and also an associate professor of computer science at the University of Central Florida (where he is currently on leave). He is a leader in neuroevolution (combining neural networks with evolutionary techniques), where he helped invent prominent algorithms such as NEAT, CPPNs, HyperNEAT, and novelty search. 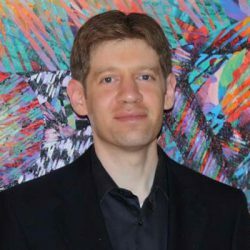 He is also an innovator in building novel video game concepts around cutting-edge AI and ML techniques, including games and toys such as NERO, Picbreeder, Galactic Arms Race, MaestroGenesis, and Petalz. His ideas have recently reached a broader audience through the popular science book, Why Greatness Cannot Be Planned: The Myth of the Objective. Discussions of creativity often focus on human achievement and its neural underpinnings, but the most prolific creator of all is evolution. All the millions of species of Earth are its products, spanning inventions from photosynthesis to human-level intelligence, and its process is so open-ended that it continues to generate fundamental novelties billions of years from its inception. This talk will first contemplate why it has proven so hard to create a computer algorithm with similar capabilities even when we appear to comprehend evolution on the surface, and will then survey milestones in our understanding that have brought us closer to producing an open-ended evolutionary process artificially. Finally, we will see that insight into the magic of creative evolution can indeed feed back into our understanding of creativity in general, and of how it may manifest within our own brains.